The wild reindeer, a holiday icon, is facing sharp population decline due to climate change. Andrey Petrov, director of the University of Northern Iowa Arctic Center, led a study of the largest reindeer herd in the world, located on the Taimyr Peninsula in the northernmost tip of Russia. Petrov’s work shows that the herd’s population has dropped from 1 million reindeer in 2000 to about 600,000 today. Scientists say rising temperatures in the region may be the cause. Petrov said, “Climate change is at least one of the variables.” He added, “We know in the last two decades that we have had an increase in temperatures of about 1.5C overall. And that definitely impacts migration patterns.” During his presentation at the Fall Meeting of the American Geophysical Union (AGU) in San Francisco on Monday, Petrov explained that the longer distance the animals have to travel in order to find cold weather is increasing calf mortality. When the reindeer have to travel further and to higher elevations in the winter, it is also more difficult to find land bearing food in the summer months. Petrov also explained that the region’s rivers are growing wider as ice in the area melts, causing more deaths as the herd attempts to swim across bodies of water. Wild reindeer are also shrinking in size. Scottish and Norwegian researchers recently released a study which found that the average weight of reindeer on Svalbard, a chain of islands north of Norway, has fallen from 121 lb. in the 1990’s to 106 lb. today. Professor Steve Albon, an ecologist at the James Hutton Institute in Scotland, said, “Warmer summers are great for reindeer but winters are getting increasingly tough.” The researchers explained that less snowfall during warmer winters means that the reindeer have to traverse sheets of ice, making it harder for the animals to reach food sources. In contrast to the Tamiyr population, the Svalbard herd is growing in size.”So far we have more but smaller reindeer,” Albon said. He added that the growing population means competition for food has become more intense. Transcript: Long time environmental activist, Sandra Steingraber recently hosted a lecture, film showing and discussion at the the University of Northern Iowa. Steingraber visited UNI to discuss three of her recent articles and give a lecture entitled “Be Arrested If Necessary.” She spoke about the role of environmental science as a catalyst for political and cultural change. Sandra Steingraber, lives in Trumansburg, New York and has worked for years with government officials and other activists to bring about changes in her home state and around the country. She is a co-founder of Concerned Health Professionals of New York and New Yorkers Against Fracking and is currently the science advisor to Americans Against Fracking. In twenty-fourteen she led a successful campaign against fracking, resulting in the process being banned in the Empire State. Steingraber is working hard to bring awareness to the effects of environmental degradation due to chemical contamination, fracking, shale gas extraction and climate change. For more information on Sandra Steingraber and her environmental efforts visit iowaenvironmentalfocus.org. Study finds consumers, retailers waste about half the produce grown in the U.S.
New research suggests that as much as half of the food produce in the United States is wasted. A “demand for unattainable perfection” in the appearance of fruits and vegetables is largely to blame for the vast amount of wasted food. Fruits and vegetables are often led in the field to rot, fed to livestock, or shipped directly to landfills when deemed unsellable because of cosmetic imperfections. According to government data, about 60 million tons of produce, worth about $160 billion, is wasted by American retailers and consumers annually. Globally, about 1.6 billion tons, valued at about $1 trillion, is wasted each year. Despite these findings, researchers recognize that there is currently no clear way to account for food loss in U.S. However, the World Resources Institute and other thinktanks are developing methods to more accurately account for food waste. Wasteful food production practices are detrimental to efforts to fight global hunger and climate change. Last year U.S. Secretary of Agriculture and former Iowa governor Tom Vilsack called for a 50 percent reduction in food waste by 2030. However, one expert argues that Vilsack’s goal could have a negative effect on food economics. Roger Gordon – founder of the Food Cowboy – told The Guardian that a 50 percent reduction in food waste could reduce the profit margin of produce at grocery stores by half. He added that fresh produce accounts for about 15 percent of supermarket profits. Officials with the University of Iowa’s IIHR-Hydroscience & Engineering hosted an event Wednesday in Coralville focused on reducing flood damage and improving water quality within the Clear Creek Watershed. IIHR-Hydroscience & Engineering Director Larry Weber was the event’s main presenter as he discussed efforts in the Clear Creek Watershed which will in part be funded by a $96.9 million grant awarded to the state of Iowa in January by the U.S. Department of Housing and Urban Development (HUD). More than 60 were in attendance for Wednesday’s event at the Coralville Public Library including representatives from city, county, and state governments, Iowa’s three regent universities, the Iowa Department of Natural Resources (DNR), the Federal Emergency Management Agency (FEMA), landowners, farmers, and various engineering firms. Weber said he thinks cooperation between public and private entities will be key in many of the upcoming projects. The $96.9 million grant was awarded to Iowa through the National Disaster Resilience Competition. The landlocked Hawkeye State received the fourth largest amount of funding behind disaster-prone coastal areas. Weber said this large sum of funding shows the need for pursuing these projects in Iowa. Weber also said that IIHR’s prior involvement in HUD-funded projects made the process easier when pursuing the most recent grant. Another reason Iowa was successful in receiving the HUD funding was because of programs and other efforts already in place that will contribute to the HUD project. The Iowa Flood Center, the Iowa Nutrient Research Center, the Iowa Geologic Survey, the Iowa DNR, the Iowa Department of Agriculture and Land Stewardship, and other agencies already have programs in place which HUD felt could be further developed with the funding it granted to Iowa. In addition, Weber said Iowa was unique among its adversaries in the National Disaster Resilience Competition because of the amount of local financial support for the practices outlined in the state’s plan. Weber credited the Iowa legislature and other state leaders for their support with establishing the Iowa Flood Center and funding other water-related activities in the state which helped Iowa’s case when applying for the recent HUD funding. “Without that commitment we wouldn’t have had the leverage that we did and we wouldn’t have been successful like we were,” he said. Wednesday’s meeting was part of an eight watershed tour that concludes today in Vinton. This week’s On The Radio segment looks at a recent survey conducted by researchers at the University of Northern Iowa which examined Iowans’ behaviors and views related to water quality. A majority of Iowans are willing to change their behavior to help improve water quality, according to a University of Northern Iowa survey. 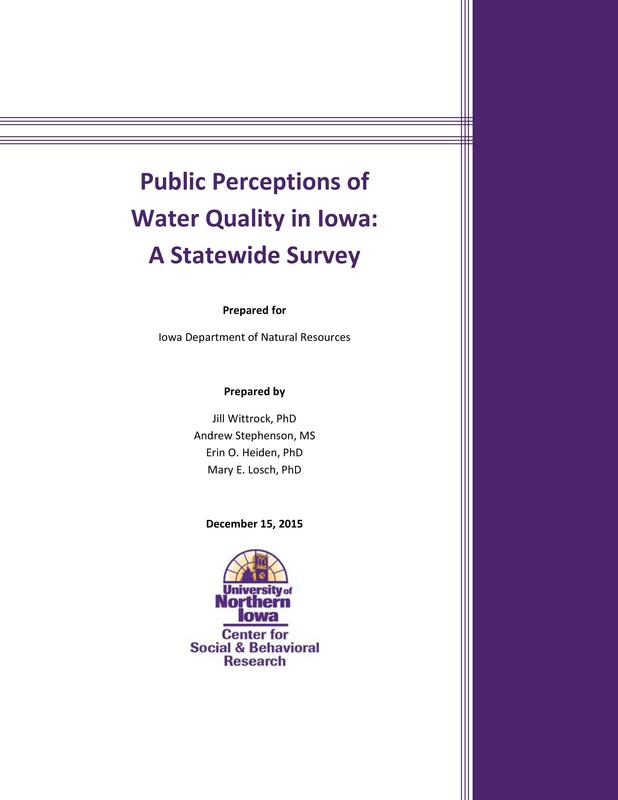 Public Perceptions of Water Quality in Iowa: A Statewide Survey, produced by the UNI Center for Social & Behavioral Research, recorded answers to a range of questions posed to Iowans on their views on water quality. Seventy percent of those surveyed said they would be willing to change a single behavior to improve water quality. Water-saving behavior changes could include refraining from pouring fat or oils down the drain, avoiding the garbage disposal and composting instead, going meatless for one day per week, and even placing a brick or half-gallon jug in a toilet tank to save water when flushing. For more information from the survey, visit IowaEnvironmentalFocus.org. 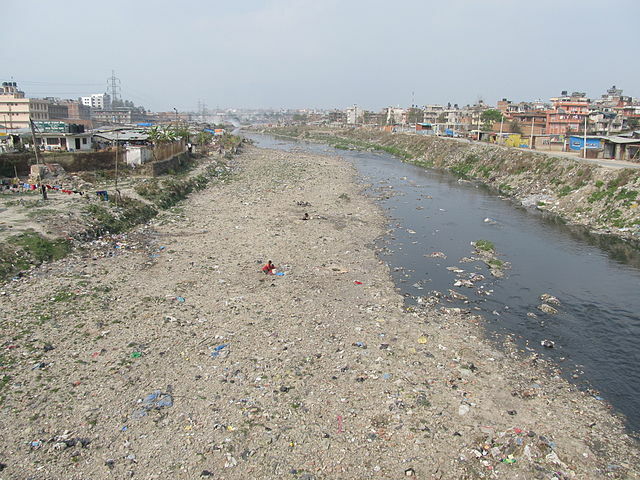 Researchers at the University of Northern Iowa are working with their counterparts at Tribhuvan University in Kathmandu, Nepal on a study that will examine the Bagmati River. The project is led by UNI earth science professor Dr. Mohammad Iqbal. The researchers started on the project during May of this year when Dr. Iqbal and two of his students traveled to Nepal. The researchers conducted water and sentiment sampling, analyzed procedures, and implemented policy changes using scientific data. The team is expected to continue working on the project through the end of 2016. Funding for this project was made possible because of a $56,000 grant from the National Science Foundation (NSF). The Bagmati River study is just one of the international research efforts in which UNI is participating. Last month NSF awarded UNI with nearly $750,000 to study environmental sustainability in the arctic. UNI will work with researchers from in Canada, Greenland, Iceland, Norway, Russia, and Sweden on the project.